Take a step back in movie time when the 80's were filled with a variety of sword and sorcerery films from Conan the Barbarian to Lady Hawke. The Beast Master was one of those movies that retold the tale of good versus in evil in an epic story that was filled with prophecy, battles and the hero rescuing the gorgeous damsel in distress. The Beast Master follows the journey of Dar (Marc Singer), a powerful warrior who almost died as an unborn child because of a prophecy that foretold Dar killing the murderous priest Maax (Rip Torn). Dar was saved by a peasant who raised the boy as his own son and taught him the skills to become a powerful warrior. Unbeknown to Dar, he also had the skills to control the beasts and on a fateful day, his village was attacked by Maax and Dar vowed vengeance. Although Maax almost accomplished the slaying of Dar by his three witches, he was banished from the lands by the King only to return and enslave the people. Joined by a beautiful slave girl (Tanya Roberts), Dar begins an amazing journey that features sword and sorcery that only the 80's could produce. Although the story is a little "cheesy", the movie still holds well with the times and is still quite enjoyable. The video quality of the DVD is a little on the grainy side but this is due to the age of the movie itself. The colours in the movie are sharp and crisp and there were no errors whatsoever that I detected on my screening on this movie. The audio quality of the disc supports Dolby Digital and certain parts of the movie sounded phenomenal through my Philips Home Entertainment system. 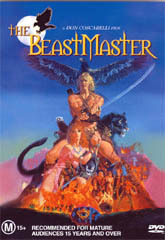 When it comes to extras, especially for such a "B" grade movie, the Beast Master is up there with the best of them and contains audio commentary by the writers, producer & director, the original theatrical trailer, behind the scenes shots, a stills gallery and a 16 page preproduction booklet that is quite rare in DVD's. As a kid, I simply adored the Beast Master (or was that because it had Tanya Roberts in the movie?) but on a more serious note, the movie dates quite well and contains two hours of escapism that could be the perfect solution for a dull night. With a thrilling storyline and a perfect DVD transfer (not to mention Tanya Roberts), the Beast Master is one of those movies that can be watched over and over again. Check it out!